Voice - Site de soundsofangkor ! The voice is also an instrument whose bas-reliefs are echoed. Epigraphy also mentions various functions of singers and reciters, men and women: singers of vocal ensembles serving worship, singers of praise, singers accompanying themselves by a musical instrument. The voice, like the instrument of music, is a matter of specialist. The texts mention the skill of the musicians and the quality of the voice of the singers. According to the stele of Kok Roka (opposite), the name of the singers informs us about the aesthetic perception during the pre-Angkorian period, the canons or the relation to music. Thus, the first singer on the list has a voice that sings melodious sounds, the second makes the gāndhāra sound (third of the seven primary notes of the Indian music system), others produce well articulated sounds, have passionate voice, contracted vocal cords or singing with the throat, others have the voice comparable to that of the heron or the wild goose. The choir does not seem to be the result of a casting tending towards uniformity, but rather towards an assemblage of diversity. The song is considered as a major discipline, as indicated by the writing in Sanskrit of the Lolei's stele (9th c.). Sanskrit poetic epigraphy refers to singing as a praise vector. Thus, on the foundation stele of Pre Rup (10th c.), we find the glory of the dedicatee sung by the living as well as by the dead. French translation of Lolei's stele: Bergaigne A.,1893. Notices et extraits des manuscrits de la Bibliothèque Nationale et autres bibliothèques. Tome XXVII, 2e fascicule, p.398. French translation of Pre Rup's stele: Cœdès G. IC I p.88 XCIX. The inscription entirely in Khmer language. Its provenance is uncertain. It was dated from the 7th or 8th c. according the typology of its writing. It is a list of servants of the temple. We give here only the two lists related to the female singers. All the singers have a name in direct relation to their function with the exception of ku Padminī. Ku Padminī: Lotus. Excellent woman. Khmer translations according to Saveros Pou, Dictionnaire de Vieux Khmer-Français-Anglais (2004). 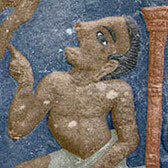 The Angkorian texts are silent about technique and vocal aesthetics, but the bas-reliefs portray characters singing. They are recognized by various signs: open mouth, tight index or specific hairstyle, sometimes these three elements simultaneously. 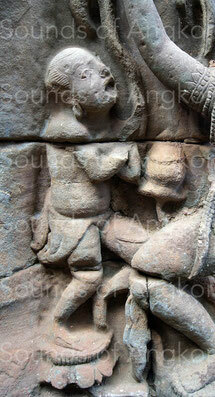 In Bayon temple, in the court orchestras depicted on bas-reliefs, we can see one or two female singers (below). The first one always sit in front of the orchestra with a raised hand; she isn't crowned like instrumentalists but capped of a single or double bun. The second singer is probably the player of small cymbals if judged by the similarity of her hairstyle. Court orchestra. Female musician wear crowns but singers a bun. Bayon. Late 12th-early 13th c.
Court orchestra. Female musician wear crowns but singer a double bun. Bayon. Late 12th-early 13th c.
This Circus scene of Bayon shows, as part of physical and the white weapon's jousts, a singing joust accompanied by string orchestras. Two "teams" clash. We can clearly see on both sides of jugglers and acrobats, the two singers on the right side expressing themselves with vehemence while the left one, alone and introspective, prepares his reply. The singing jousts are known until now in Cambodia. Given the nature of the instruments, low volume, we do not think that they accompanied the games presented in the scenes above.